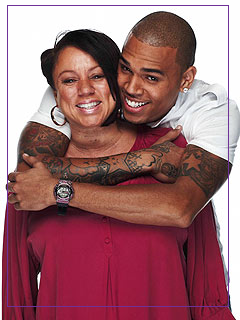 If you know anything about Chris Brown's management/business you know that his adorable mom Joyce Hawkins "Mama J" has played a huge role. If you follow her on twitter or know anything about her you also know that she LOVES her son. Everyday on twitter she sends out positive messages to and about him. She has many reasons to be proud of her son. Most recently he took the time out to play some ball with a few special needs kids. They look like they're having the time of their lives. Chris is known for having great basketball skills, and seems to recently have a passion for helping out wherever he can with special needs people. I think this is adorable, and really gives Mama J something to smile about and be proud of as well. Watch the video of Chris balling with his buddies below! While she's always flashing that huge smile, "Mama J" also does not come off as someone you want to cross. She is known for keeping it all the way real on her twitter account. The most recent example of this came when blogs and tweeties assumed she was throwing shade at Rihanna post her recent sit down with Oprah. You have to love how real she is. Not that she had to clear that up, but I like how she did it. People will believe anything.